I have read through the OSPSuite definitions and the stimulating discussions in the threads #125, #176 and #177. However, I would like to have insights on the situation I have w.r.t. the available data and a reconfirmation as to my implementation is correct or needs reconsideration. Moreover, in any of the cases, I do not have information on the t1/2 of the assay or measuring time. Therefore, in such a situation, how do I differentiate as to which process type should I use among the highlighted? 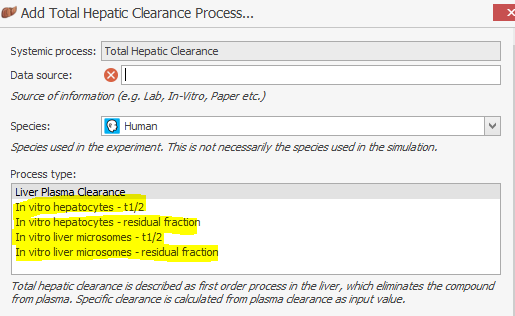 and In vitro liver microsomes residual fraction for Microsomes and S9 subfractions) where I have calculated the value of Specific clearance from the data. Am I taking the correct approach? Should I be vary of anything else?